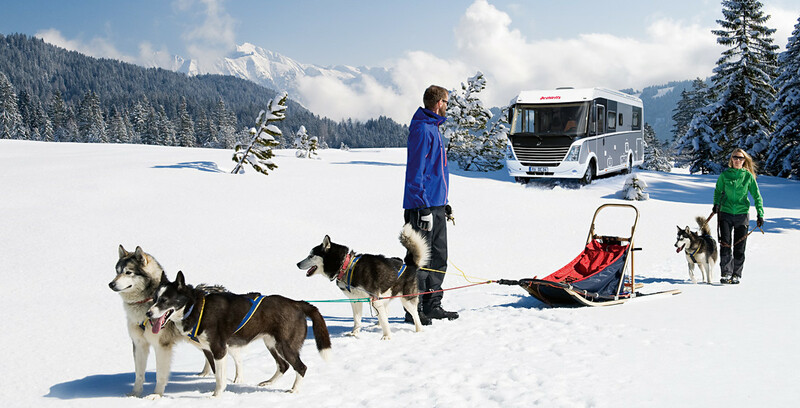 With our Winter Comfort packages we winterise motorhomes even with no double floor. Components: Insulated, electrical (12 V) and heated under-floor pipes, siphons and waste water tank, all-around Styrofoam insulation and much more. Additional comfort comes with the Winter Comfort package LUXUS with Webasto auxiliary heating, electrical floor heating and 95Ah additional leisure battery. Both of the packages are available in combination with ALDE warm water heating. It warrants cosy wellness atmosphere like at home and works without blowers. Ideal for allergy sufferers! Also the floor warming is possible with installed water pipes in the floor; Dethleffs even offer a warm water heating for the cab. The better the insulation of your vehicle the less energy you will need for heating or conditioning of the rooms. The living room construction of your Dethleffs motorhome is made of thick sandwich elements with 34mm wall thickness and 41mm floor thickness – above-average values developed for first class insulation.